This meme portrays the harsh weather conditions that we have been currently experiencing with relation to having to go out in it to Wegmans specifically. It is worthy of study because viewers from the Rochester area can relate based on the fact that they have all been experiencing this weather together and are all familiar with Wegmans. 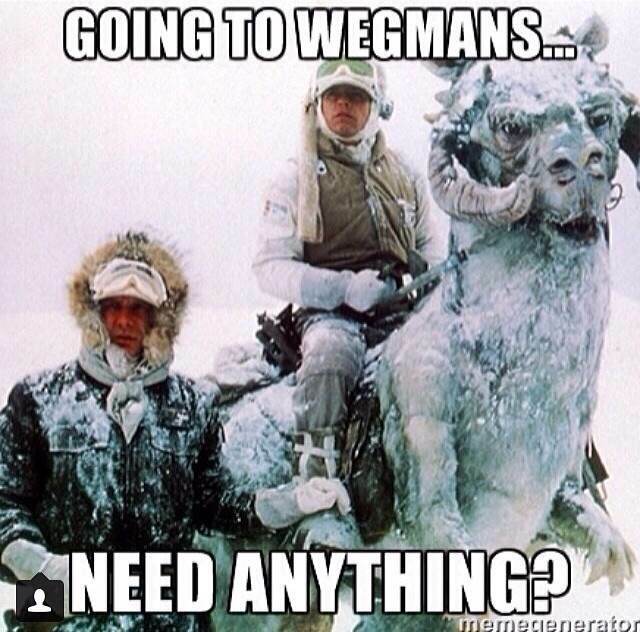 The meme relates to two different things being Wegmans and terrible winter weather conditions. The meme evokes positive emotions due to humor because even though the weather is miserable, most people are able to laugh at the image used in the meme and it’s relevance, despite it’s an exaggeration. It can also result in a conversation for those who are familiar with Wegmans because that is another aspect aside from the weather that people can relate to. Personally, I know a few people who have moved to areas where there aren’t any Wegmans stores and they state how much they miss it. Those familiar with the store typically really enjoy the store and everything that it has to offer. I actually found the image on Instagram and read the comments that followed. For the most part, the comments were people’s laughter but there were also the few comments stating jealousy because they don’t live near one, or saying how much they miss Wegmans because they moved somewhere which doesn’t have one. This caused much conversation because then it turned into the people who moved away talking about what grocery stores they have and about how much different they are and how they don’t compare to Wegmans. Disappointment or sadness may be evoked from these people because they miss living in an area with multiple Wegmans locations. Another emotion that could be generated due to this meme is love because many people are “in love” with Wegmans and really value it. Potentially, anger could be evoked due to the frustration of dealing with this awful winter season and the fact that they want it to just be over already. The question, “Need anything?” is phatic and can be used very generally. The addition of the statement, “Going to Wegmans…” pulls it all together to make an understanding of why the photo was chosen for the meme. The meme is effective because it’s relatable for a vast range of ages, any race, gender, nationality and religion. The only stipulation, as stated before, is actually having experience with Wegmans as well as with living in an area where it snows. All in all, this specific meme generates various emotions resulting in conversations and relativity to those living in the same area.